PEOPLE'S CLIMATE MARCH 2017: HOW IS IT DIFFERENT THAN THE MARCH FOR SCIENCE? This Saturday, April 29, the People’s Climate March will happen in cities worldwide on the 100th day of President Donald Trump’s Presidency. So how are the March for Science and the People’s Climate March different? The March for Science was a march in support of science in general. There was a large rally and march in Washington, D.C. that ended in front of the Capitol as well as sister rallies and marches. People showed up in the thousands with signs supporting medicine, research, the climate and just plain old facts. The People’s Climate March is a little different, mainly because it solely focuses on climate science and climate change. It started in 2014 during the United Nations Climate Summit. Hundreds of thousands of people traveled to New York City where the summit was being held to march through the streets to demand action on climate change. Every year the United Nations hosts a climate conference during which leaders from around the world come together to discuss climate change. The most well-known climate summit was COP21, the 2015 summit in Paris where the Paris Agreement to fight climate change was signed. The 133 countries worldwide that have signed the agreement did so to affirm their pledge to reduce carbon emissions and keep climate change to below 2 degrees Celsius, that’s about 3.6 degrees Fahrenheit. President Donald Trump has said he may want to rescind the United States’ participation in the agreement, but he has yet to do so. 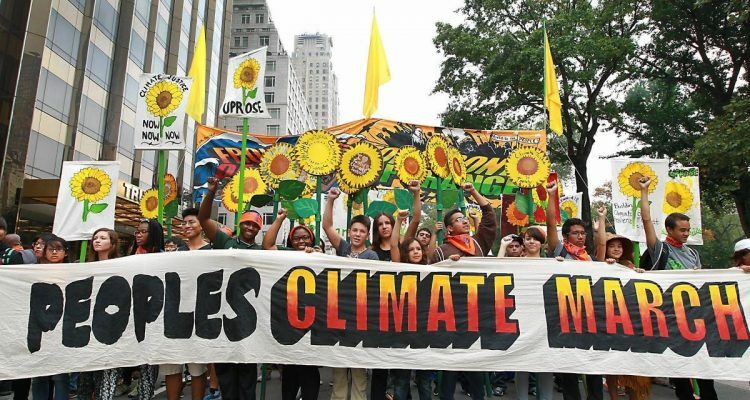 The People’s Climate March is a leaderless and diverse action group that demands change each year from a local level up to an international level. During the 2016 elections the group developed a platform that was strong enough to articulate the issue of climate change and take on a Trump administration, according to their website. "In the context of the Trump Administration’s climate change denying and a Congress controlled by the right-wing it is clear we all must both protect the gains made in recent years, even if those have been limited gains, while we articulate and demand initiatives to move our nation to a new, clean energy economy." The goal of the march is to push against the Trump administration while pushing forward for a more environmentally friendly world, according to the group. The Washington D.C. march has three components to it: build, resist and rise. The first of the three stages of the march will begin at the Capitol building at 11 a.m. and the group will begin marching an hour and a half later at 12:30 p.m. The plan is to the march to the White House and surround it to loudly demand climate justice (this is the resist part of the march). Then the “rise” part of the march will happen when the group marches to the Washington Monument to come together as a community of environmentally concerned citizens. There will be music, art, socializing and group activities at this point in the day. The group has even planned out different areas for those marching to meet up and line up so that they can march in groups of specialties. The groups include, “Protectors of Justice,” “Creators of Sanctuary,” “Builders of Democracy” and more. A list of sister marches, including Climate March New York City, San Francisco and more, can be found here.